NeoGames is one of the biggest providers of iLottery solutions to national and state lotteries. It recently released a new title called King of Clubs. This is an e-Instant game that is not just entertaining, but very beneficial for players as well. King of Clubs has some very innovative multi-level bonus rounds, which makes the gaming experience better than ever. Do you like surprises? Then try King of Clubs, and you won’t be disappointed. King of Clubs is a popular e-Instant game, which was created by NeoGames Studio. NeoGames demonstrated the King of Clubs at the ICE Totally Gaming 2018. This event took place from February 6 to February 8 in London. It was a great show, since the newest and most popular releases from interactive lottery games were released. Another success after the queen? After the release of King of Clubs players showed their interest immediately. In no time the game ascended to the top position in the customer portals of NeoGames worldwide. King of Clubs follows into the footsteps of the royal queen game. So it’s a ‘royal family of e-Instant games’ already! The previous game got some very positive reviews and King of Clubs hopes to repeat the success. There is a big chance that the NeoGames become a worldwide phenomenon, or perhaps they already are. 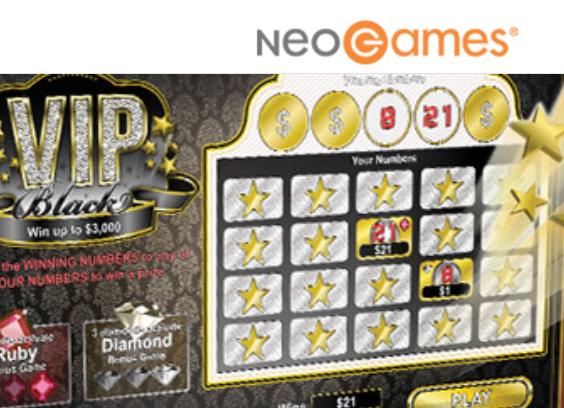 NeoGames can be seen as a pioneer of the worldwide interactive lottery gaming market. It has been providing iLottery software and services for years, and can be seen as one of the very best in its field. The solutions are omni-channel, which means that they can be used in several ways. By doing so, every lottery player can have fun and generate a maximum revenue. For example, thanks to iLottery 360° solution of NeoGames it became possible to play games on several connected devices. The solution also consisted of a set of player operational services and a back-office platform. Mr. Kfir Matalon is head of games at NeoGames. He is very positive about the company and it’s future: “Our dedicated in-house game studio, a powerhouse of creativity, is a key part of the value we deliver to lotteries”. Matalon also talked about the games, which he calls ‘visionary’. Every year the customer must have a compelling new experience and the team of NeoGame knows how to make that possible. The NeoGames team knows how to customize exciting games and all the rules that surround them. Because of their experience, they’re able to create new opportunities for lotteries all over the world. What is the secret behind the success of NeoGames? The team behind NeoGames had big dreams when they established their company. Becoming the best scratch card software provider in the world was their ultimate goal. However, no one expected that NeoGames would climb up to the top so quickly. Nowadays the company sells over 120 million online scratch cards to people all over the world! What’s more, it’s the market leader on instant win games and scratch games. How did Neo Games manage to become to successful? NeoGames is a company that specializes in the production and selling of scratch cards and instant win games. The motto of this company is “act local, be global”. NeoGames definitely acts to it, since it has several locations around the world. Customers can contact it in more than twelve languages. The numbers of NeoGames are absolutely impressive. It has already broken a selling record to international customers in 2008, when more than a billion scratch cards were sold! In the near future other records will probably be broken as well, since NeoGames continues to design games with excellent graphics and audio features. The company also strives to expend its B2B marketing operation every year. The many games of Neo Games are developed in-house and made with an eye for quality. In the last couple of years more and more people discovered the excellent quality. For example, the design of the scratch cards is amazing. Sometimes these cards have a special theme, such as a TV show or a popular sport. Of course it’s also possible to play with a traditional scratch card. The high quality has been one of the reasons for the staggering growth of Neo Games. This company has a license from the Lotteries and Gaming Association of Malta, which means that it can sell scratch cards in Europe and beyond. It also proves that Neo Games offers fair games. Everyone who buys a scratch card has the same chance to win. Besides that, all the software is regularly tested by gambling experts. By doing so, everyone knows that the random number generator (RNG) isn’t manipulated. It usually works perfectly, and so does the support mechanisms for the players. NeoGames works together with many licensed partners. This is definitely one of the reasons for its success, since cooperation can make companies much bigger and stronger. Among the partners of NeoGames are Betsson and Bet365. These gaming companies are well-known all over the world. NeoGames has also decided to work together with several companies working outside the gaming industry, including OK Magazine and Mirror Newspaper. It seems that the secret behind the success of Neo Games is constantly providing high quality, great customer service and the fact that it works together with other companies.